Hillside Equestrian Meadows' Laki, having run against and beaten some of the region's top sprinters this year, will have the benefit of home track advantage over fellow multiple stakes-winning shippers Altissimo and Cautious Giant in Saturday's $100,000 Dave's Friend at Laurel Park in Maryland. The six-furlong Dave's Friend for 3-year-olds and up is among six stakes worth $550,000 in purses on a 10-race Christmastide Day program that highlights the final weekend of the calendar year-ending 2018 fall meet. Laki, trained by Damon Dilodovico, ended an 11-week break between races with a sharp half-length victory in the six-furlong Howard and Sondra Bender Memorial Stakes Dec. 8 at Laurel. The leading older sprinter in this year's rejuvenated Mid-Atlantic Thoroughbred Championship (MATCH) Series, Laki hadn't run since finishing second to multiple graded-stakes winner Switzerland in the Frank J. De Francis Memorial Dash (G3) Sept. 22. All seven of Laki's wins have come in 11 career starts over Laurel's main track, with three seconds. Regular rider Horacio Karamanos will be aboard from Post 5 of seven at 120 pounds. Moshe Mark's Cautious Giant has earned $581,790 from 42 career starts, nine of them wins, having been based in South Florida since last fall. He has won two stakes, most recently in the six-furlong Trinniberg Sept. 8 at Gulfstream Park and was third in a pair of Grade 2 stakes in 2016 while on the southern California circuit. Christian Pilares, Altissimo's regular pilot, is named from Post 2 at co-topweight of 122 pounds, while Laurel meet-leading rider Trevor McCarthy has the call on Cautious Giant from Post 3 at 120 pounds. Laki's stablemate Team Tim; Midtowncharlybrown, front-running winner of the Fabulous Strike Stakes last out Nov. 21 at Penn National; Colonel Sharp and Perfect Cover are also entered. S.M.D. Ltd's Miss Avalon beat fellow Pennsylvania-breds by 3 ¼ lengths in a one-mile, 70-yard allowance Nov. 12 at Parx, two starts after running third in the Mrs. Penny Stakes. This will be her shortest race since finishing third going six furlongs June 9, also at Parx. Cash is King and LC Racing's Modacious exits a one-length optional claiming allowance triumph as the favorite going one mile Dec. 11 at Parx. It was her second straight time going at least eight furlongs after opening 2018 with three consecutive sprints. Diamond M Stable and Roll the Dice Thoroughbreds' Lady Vicki takes a four-race win streak into what will be her stakes debut for trainer Lacey Gaudet. Acquired privately after a dominant maiden claiming win July 27 at Saratoga, the 3-year-old Boys at Tosconova filly won a pair of starter optional sprints and earned a gutsy nose triumph when stepped up and stretched out to a mile in an open entry-level allowance Dec. 9 at Laurel. Total Control, Forever Liesl, Sower, Timeless Curls, Lake Ponchatrain, Isotope, Dorodansa, Squan's Kingdom, Mo Knows and Enthrall complete the field. Runnymede Racing's Alwaysmining, impressive front-running winner of his last two starts, wheels back in three weeks seeking his second consecutive stakes victory in the $100,000 Heft. D.J. Stable's Press Virginia also got started late, capturing his debut by 1 ½ lengths going six furlongs Nov. 21 at Penn National before taking an open, seven-furlong entry-level allowance 20 days later at Parx by 3 ¼ lengths. Where Win Win Win has raced exclusively at Laurel, Press Virginia will be trying its main track for the first time. Larry Johnson and R.D.M. Racing Stable's No Mo Lady, narrowly beaten in her stakes debut earlier this month, returns looking to reverse that finish in the $100,000 Gin Talking. Trombetta also entered Commonwealth New Era Racing's Enjay's Brass, just 15 days following her 4 ¼-length optional claiming allowance win going 5 ½ furlongs Dec. 14. The effort was her first since finishing fifth in the one-mile Tempted (G3) Nov. 2 at Aqueduct. Jagger Inc.'s Our Super Freak will be making her first start since running second at odds of 16-1 in the six-furlong Smart Halo Stakes Nov. 10 at Laurel. The Mineshaft filly won her two previous starts, including a 6 ¼-length optional claiming allowance triumph Oct. 27 at Laurel. Loooch Racing Stables' Destiny Over Fate will be making her stakes debut in the Gin Talking. An impressive debut winner June 13 going five furlongs, she never fired over a sloppy, sealed track when returning to action Oct. 27 against Our Super Freak, but bounced back with a gutsy performance to be third by a neck to Belial in an optional claiming allowance Nov. 17. “She won her maiden impressively and then I took her to Saratoga and hoped to run her up there and she bucked her shins. We gave her some time and then her first race back was in the one-hole and in the slop and we just threw it out,” trainer Lacey Gaudet said. “She just got beat in the allowance race going seven-eighths and she came out of the race really, really well. I like the distance and, hopefully, it's going to key her up for a nice 3-year-old campaign. 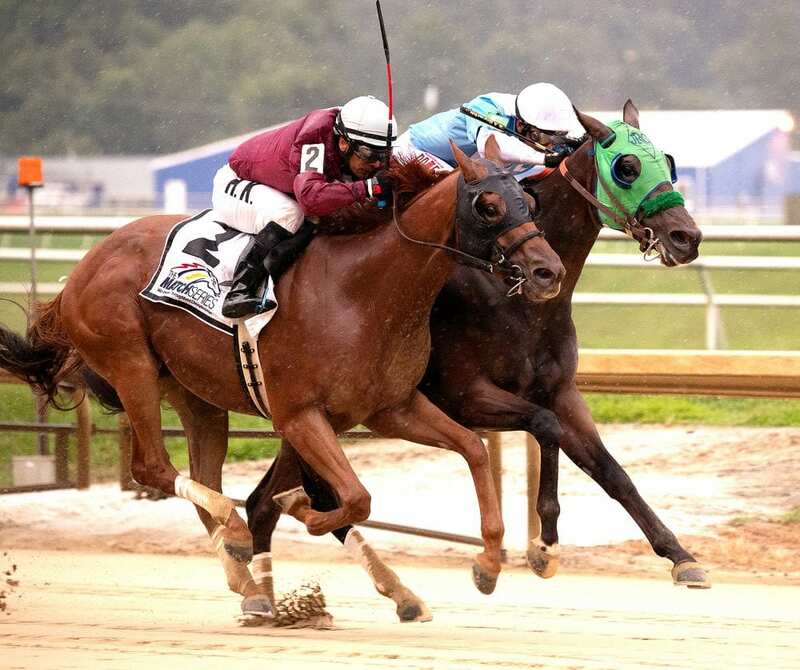 This entry was posted in Racing and tagged cautious giant, christmastide day, Damon Dilodovico, dave's friend stakes, gin talking stakes, heft stakes, horacio karamanos, Horse Racing, laki, laurel park, thirty eight go go stakes by Press Release. Bookmark the permalink.